Eye of the Temple community · Posted in Just finished Eye Of The Temple 2nd build. And one more thing! 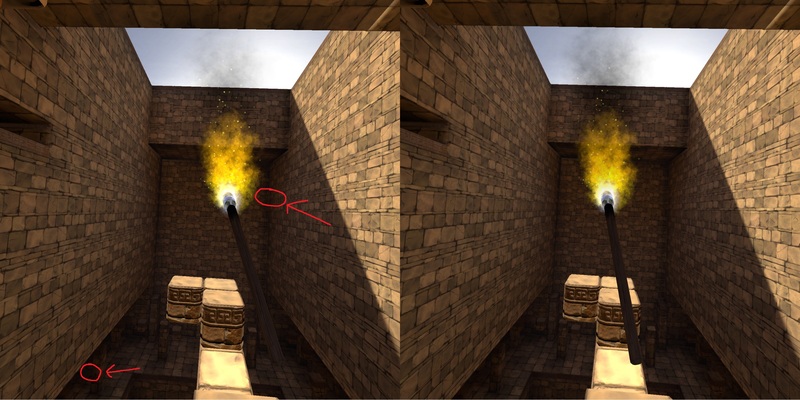 When I played eye of the temple I used this spin counter: https://github.com/matzman666/OpenVR-AdvancedSettings to "untwist" myself and I did it a lot. I suggest adding this feature. Yes! Speed-running is a great idea for much more replay value and more interesting gameplays. Of course there would be need for leaderboards because if there is no time to beat speed-running isn't worth it. Eye of the Temple community · Created a new topic Just finished Eye Of The Temple 2nd build. Overall I'm impressed. I played on 1.5 supersampling on GTX 1080 & i7 6700k and game was butter smooth apart of these white dots that have occurred twice. Once on the 3rd attempt with "boss" and second time at the end. It might be my fault but I have never seen them in other games. Now I will tell my favorites and least favorites moments of the game. + Sliding cylinders. These blocks are very cool and satisfying to move on. + Torch. Shadows were done nicely. + Different paths. While Chrysalis Pyramid lacked of choosing different paths this time you didn't disappoint me and I really appreciate it! +/- Background. Personally I find that background is not really well suiting rest of the game but it isn't bad either. I would change it to something more ancient-like. - Respawn time. It might be bugged but sometimes I fell not from my fault and even standing on feet symbol I needed to wait about 5s for respawn. I found it to be really frustrating but that's my only major complaint. Suggestions: Hard mode(platforms don't stop at all you need to walk on them right on time I don't know if it would work but that's my dream), Different textures, More levels, traps (arrows etc. ), more interaction with hands (like picking a bow and shooting something or taking a ball/parts from one place to another). Thank you for reading and thanks for sending me your build. Currently I would pay 10$ for that state, for twice longer playtime I would pay 15$. Also please don't be afraid of doing sales (even 10% sales). Very nice prototype! Would definitely buy.